Recently, Tapscape reported that Apple’s total computer sales (ie Macs, iPhones, iPads, etc) surpassed those of Microsoft. Some readers harumphed their indignant apathy toward the subject. Now, Microsoft has signaled their reaction to Apple’s milestone by slashing Windows 8 prices by 70 percent. Of course, Apple and its ubiquitous iPhones, iPads and Macs aren’t the only challenges Microsoft faces. Google’s massive Android ecosystem and insurgent Chromebook are also eating away at Redmond’s once unassailable dominance. Perhaps that is why Microsoft has decided not to cut, but slash Windows 8 prices by 70 percent. The company now offers Windows 8.1 to OEMs (original equipment manufacturers) for $15 when pre-installed on devices that retail for less than $250. Previously, Microsoft had demanded a $50 Windows 8.1 license fee for under-$250 devices — that’s a massive 70 percent discount. Windows 8 Prices: Fire Sale! So, who cares if Apple now sells more computers than Microsoft? Quite obviously, Microsoft cares a great deal. Even as Windows PC sales continue to implode, down by double-digits in 2013, tablet sales have exploded. Of that $80 billion market, Redmond claims only a minuscule, single-digit share. The software giant’s standing, not to mention future prospects, in the smartphone space are equally dismal. 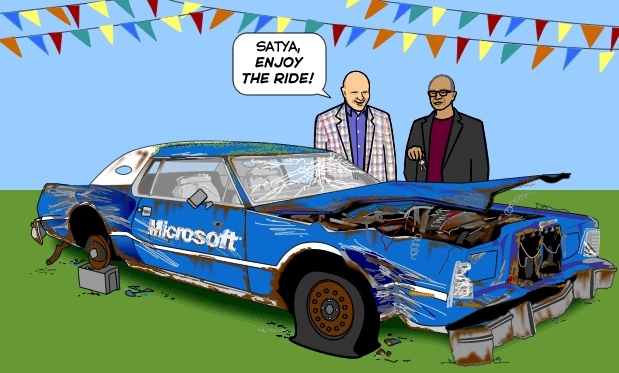 Microsoft’s response is to slash its Windows 8 price and race to the bottom. Is that a meaningful and proportionate response, or is the company just plain desperate and beyond saving? Recently, the market punished Apple’s share price because Mac sales increased by only 19 percent and iPad sales a mere 14 percent rise. Google, for its part, is now challenging Apple as the world’s most-valuable company — GOOG shares continue to rise, almost inexplicably.